You could win one (1) LED Smart TV; one (1) TV Soundbar; one (1) Wireless Music System; one (1) LED Light Up Foosball Table; one (1) Tabletop/Bartop Arcade with 412 Games; $2,000.00 Wayfair gift card, terms and conditions apply; one (1) Mixology Bartender 10 Piece Bar Tool set; $1,500.00 Home Depot gift card, terms and conditions apply; one (1) branded freezer and one (1) year supply of DEVOUR products awarded as one hundred four (104) product coupons that expire April 30, 2020. Each coupon is redeemable for any one (1) Devour Frozen Meal or Sandwich product (valued at up to $3.00). ARV: $8,369.97. 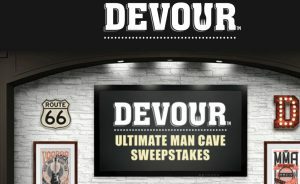 Fifteen (15) First Prizes: One (1) branded freezer and one (1) year supply of DEVOUR products awarded as one hundred four (104) product coupons that expire April 30, 2020. Each coupon is redeemable for any one (1) Devour Frozen Meal or Sandwich product (valued at up to $3.00). ARV: $1,000.00. Total ARV of Prize: $23,369.97.